Dystopian near future science fiction novel about a company that resembles Google about to “complete the circle”. VR-storyline with immensive amounts of references to the best of eighties geek culture. Immortality and funny VR engulfed with ethical dilemmas. Recent version of Terminator commit a global DDoS-attack. Intergalactic adventure centered around IPO. Hilarious satire. The Singularity themed scenario disguised as Space Opera. he new book “2052: A Global Forecast for the Next Forty Years” by Jorgen Randers raises the possibility that humankind might not survive on the planet if it continues on its path of over-consumption and short-termism. In the report author Jorgen Randers raises essential questions: How many people will the planet be able to support? Will the belief in endless growth crumble? Will runaway climate change take hold? Where will quality of life improve, and where will it decline? Read more about the book on The Club of Rome. The atrocities committed against innocent civilians in the recent terrorist attacks in Norway shows how much harm and disruption one person can do against an unprepared society. Is the attack a precursor for a general transformation and individualization of terrorism? According to the evolution of military theory advanced surveillance, intelligence and sophisticated weaponry is useless against terrorists like Anders Behring Breivik (ABB). This was confirmed by the chief of the Norwegian chief of internal security (PST) admitting that even the STASI secret police couldn’t have stopped the attack. The conspiracy theory crowd is looking at the transhumanist movement for evidence of a planned eugenic robotic utopia for the elite. Unfortunately this means a robotic hell for you. I actually enjoy sites like “The Labyrinth of the Psychonaut” and “Red Ice Creations” – not for it’s quality of content but as pure entertainment. In the same way I find many conspiracy sites interesting. Trying to tie transhumanism up with eugenics and elite population control is not new. The transhumanists are well aware of the history of eugenics and do their best to promote the idea that transhumanism is the best for humankind, and not just for the few with bionic implants. Even though the liberal transhumanist like to think of themselves as the true transhumanists there are other factions taking a much more reactionary approach. This faction is also active in Italy, see “The Complicated Politics of Italian Transhumanism” from IEET. Read more about conspiracy theories and the transhumanist movement at Vigilant Citizen(Transhumanism, PsyWar and B.E.P.’s “Imma Be”) and Euromed (Increasing Propaganda For March Towards Posthuman Robot Hell). Also see R.U. Sirius (Welcome to the Home of Satanic Transhumanist Elite Conspiracy) and Michael Anissmiov‘s comments. The most comprehensive analysis of this paranoia is on Khannea Suntzu‘s Blog (“Demonization for dummies”). Stem cell treatment offers the greatest potential of a cure for many age-related illnesses. Right now, doctors are struggling to find practical applications of technology that has been proven in laboratory settings, said S.Natarajan, Chairman and Managing Director, Aditya Jyot Eye Hospital. Can we emulate the brain to create supercomputers far beyond what currently exists? And will we one day have tools small enough to manipulate individual neurons — and if so, what might be the impact of this new technology on neuroscience? BEIJING/WASHINGTON (Reuters) – Israel has limited sway over China but hopes that sharing its fears about Iran’s nuclear program will persuade Beijing to back tougher sanctions on Tehran, Defense Minister Ehud Barak said on Friday. Micro helicopters, the kind that fit in the palm of your hand (and sometimes spread holiday cheer) are huge fun — and hugely frustrating. Have you ever tried to get one to hover in place next to another? Impossible! MIT thinks it can do that, not with just two but thousands of the little beggars all hovering in harmony as part of a project called Flyfire. By using LED-equipped drones the project pledges to build free-floating 3D displays, endowing them with enough smarts and positional awareness to organize themselves into an airborne canvas. It sounds deliciously exciting and challenging, yet for some reason the school has decided you aren’t to know about it, pulling its concept video and website offline. We can only imagine there’s a government agency involved here, possibly trying to stem the virulent spread of robo-socialism, but we invite you to leave your own conspiracy theories in comments. We need to implement reglobalization from the bottom-up in order to achieve a more sustainable global economy. Geopolitics is an extension of the Enlightenment view of human nature, the idea that we pursue our utilitarian pleasures and individual self-interests. In geopolitics, the nation-state becomes a macro view of that. Nations deal with nations by being rational, detached and calculating, pursuing self-interests, excercising power and acquiring more capital and wealth. That’s why Copenhagen failed. The world leaders weren’t thinking biosphere, they were thinking geopolitics. Everyone was looking out for their nation’s self-interest. Independent from this military-inspired research, nanotechnology researchers in France have developed a hybrid nanoparticle-organic transistor that can mimic the main functionalities of a synapse. This organic transistor, based on pentacene and gold nanoparticles and termed NOMFET (Nanoparticle Organic Memory Field-Effect Transistor), has opened the way to new generations of neuro-inspired computers, capable of responding in a manner similar to the nervous system. 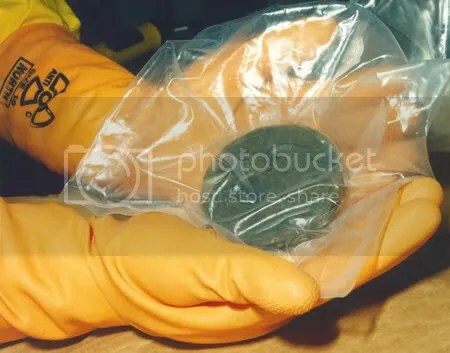 John Hunter, from the company Quicklaunch, which was set up by himself and two other scientists, bases its plans on previous work they carried out at the Lawrence Livermore National Laboratory in California. In 1992 Hunter and his colleagues fired a 130 m (425 ft) cannon built to test launch hypersonic engines. Its piston, driven by methane, compressed hydrogen gas that expanded up the barrel of the over-sized gun to shoot the projectile. Hackers seeking source code from Google, Adobe and dozens of other high-profile companies used unprecedented tactics that combined encryption, stealth programming and an unknown hole in Internet Explorer, according to new details released by researchers at anti-virus firm McAfee. Reuters has some interesting scenarios of what could happen in the Google-China standoff. The history of cyberwar has only just begun, learn about its beginning in “Onward Cyber Soldiers” from Time Magazine, 1995. It is our contention that energy is not the only resource that will be scarce in the immediate future. We envisage scarcities of food, water, and a whole variety of minerals that are crucial to the operation of a modern economy. Our thinking so far has focussed on the 2020s as the decade in which scarcity starts to be felt (we call it ‘Scarcity Bites’), but recent events have drawn our attention to a much earlier manifestation. A recent article in The Independent (see below for link), has drawn our attention to the case of the Rare Earth Elements (REEs), a group of 17 rare metals that are essential to the manufactures of the modern economy which are in a situation of scarcity (demand outstrips supply). The picture is further complicated by China being the main source of the REEs (it supplies over 95% of the world total of REEs) and following a policy of restricting their export. This conjures up some fascinating possibilities for the future. Source: The European Futures Observatory. VLADIVOSTOK, Russia (Reuters) – Russian Prime Minister Vladimir Putin said Tuesday U.S. plans for a missile defense system were the main obstacle to reaching a new deal on reducing Cold War arsenals of nuclear weapons. Russia’s leaders have remained wary about Obama’s revised missile defense plans, which are based on sea- and land-based missile interceptors in Europe. “If we are not developing an anti-missile shield, then there is a danger that our partners, by creating such ‘an umbrella,’ will feel completely secure and thus can allow themselves to do what they want, disrupting the balance, and aggressiveness will rise immediately,” Putin said. “In order to preserve balance … we need to develop offensive weapons systems,” Putin said, echoing a pledge by Medvedev last week to develop a new generation of strategic nuclear weapons. Putin said Moscow wanted more information about the U.S. plans in exchange for details about Russia’s deployed nuclear offensive missiles. “The problems of anti-missile defense and offensive weapons are very tightly linked to each other,” he said, adding that talks on a new treaty were moving in a generally positive direction. The State Department’s Kelly said the new START agreement would “break no new ground” on defensive weapons systems. Scientists at the U.S. Department of Energy’s (DOE) Argonne National Laboratory and Northwestern University have discovered that common bacteria can turn microgears when suspended in a solution, providing insights for designs of bio-inspired dynamically adaptive materials for energy. Documentary based on the book with the same name by Alvin Toffler, narrated by Orson Welles. 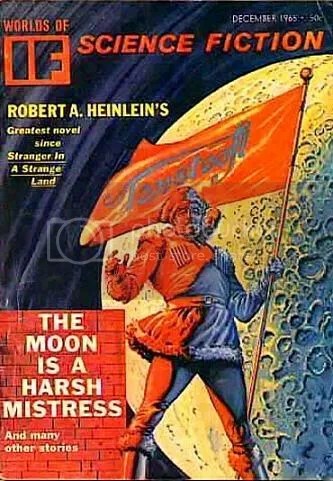 Science Fiction (SF) literature, artwork and films are works of imagination, but often contain some elements of plausibility, with the story revolving around some known facts as well as inventions and possibilities that are to all intents and purposes beyond our current technologies. Although Science Fiction is not about predicting the future, several SF authors have taken modern technology and concepts (of their own time) and anticipated with some accuracy how new technologies would change our lives, well before these technologies were actually possible. Cyber war has moved from fiction to fact, says a report. Compiled by security firm McAfee, it bases its conclusion on analysis of recent net-based attacks. Analysis of the motives of the actors behind many attacks carried out via the internet showed that many were mounted with a explicitly political aim. It said that many nations were now arming to defend themselves in a cyber war and readying forces to conduct their own attacks. 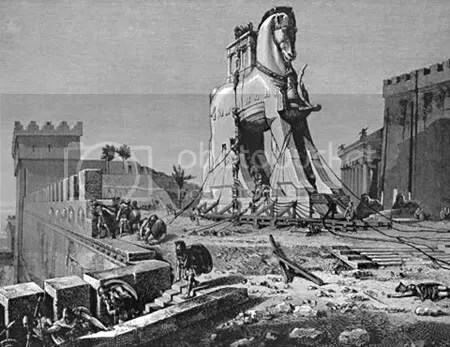 While definitions of what constitutes cyber war are not shared, it was clear that many nations were preparing for a future in which conflict was partly conducted via the net. “There are at least five countries known to be arming themselves for this kind of conflict,” said Greg Day, primary analyst for security at McAfee Europe. Nasa’s experiment last month to find water on the Moon was a major success, US scientists have announced. The space agency smashed a rocket and probe into a large crater at the lunar south pole, hoping to kick up ice. Scientists who have studied the data now say instruments trained on the impact plume saw copious quantities of water vapour. One researcher described this as the equivalent of “a dozen two-gallon buckets” of water. The 1.6km-high plume of debris was kicked up by the Lunar Crater Observation and Sensing Satellite (LCROSS) last month when it crashed into Cabeus crater. “We’re unlocking the mysteries of our nearest neighbour and, by extension, the Solar System,” said Michael Wargo, chief lunar scientist at Nasa’s headquarters in Washington DC. The identification of water-ice in the impact plume is important for purely scientific reasons, but also because a supply of water on the Moon would be a vital resource for future human exploration. Finally some useful research from NASA, BBC reports. Now let’s get that space-elevator hooked up to a permanent base. 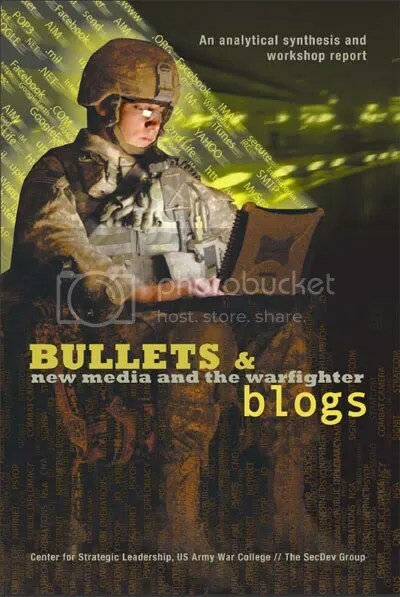 From the US Army War College’s Center for Strategic Leadership and The SecDev Group comes “Bullets and Blogs: New Media and the Warfighter” (2.7mb PDF). The report is based on a three-day workshop that took place at Carlisle Barracks in January 2008, one of the best events I have attended. It is required reading for anyone (e.g. more then than the Defense community) involved in the modern information environment.